Emory and Winship leadership Jon Lewin, MD, Claire Sterk, PhD, and Walter J. Curran, Jr., MD, with Winship Gala Honorary Chairs Anne and Berny Gray. The fifth Winship Cancer Institute Gala raised more than $1.1 million for cancer research at Winship. Proceeds from the event, held on Saturday, March 24 at the St. Regis Atlanta, will support the new Winship Center for Cancer Immunology as well as research projects focused on cancer prevention, diagnosis, and treatment. The theme of the Winship Gala was imagination, celebrating the creativity used by Winship faculty to develop new and innovative ways to approach cancer. 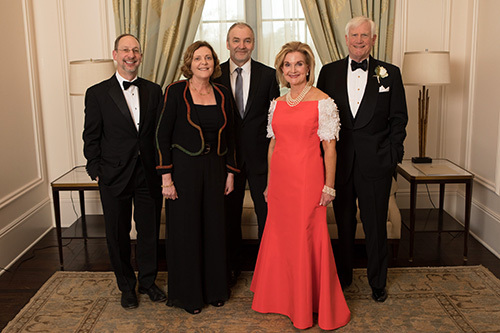 "Our generous donors and corporate sponsors have made the Winship Gala a wonderful success," says Walter J. Curran, Jr., MD, executive director of Winship. "We are grateful for every participant, and especially for our dedicated Gala chairs, Gayle Alston and Betsy Glenn, and our honorary chairs, Anne and Berny Gray." High level Winship Gala sponsors included the Ma-Ran Foundation, the Wilbur and Hilda Glenn Family Foundation, Brenda and Mac Nease, and Cox Enterprises, Inc.